I’m not shock off my socks that Uncle Sam did not foot the bill on the construction of the wine cellar in Villa Taverna. But the OIG Report on US Mission Italy (which has good things to say all around) has an enlightening item on the wine cellar constructed during the tenure of former Ambassador Spogli. On October 10, 2008, American and Italian vintners and wine enthusiasts funded a $1.1 million wine cellar for the historic Villa Taverna, the residence of the U.S. Ambassador to Italy. The wine cellar’s inventory of 2,426 bottles of wine is valued at about $69,000. The wine cellar’s maximum capacity is 5,000 bottles. The Department approved all donations for the wine cellar and wine. The wine cellar will be used as a diplomatic tool to emphasize the friendship and commerce between Italy and the United States. It will highlight, through showcasing American and Italian wines, American entrepreneurs’ investment in Italian wines and vice versa. The mission has a policy in place that requires replacement of wine extracted from cellar for the Ambassador’s personal use. To maintain the wine cellar, the management recommends to the Ambassador that his residence manager advance or bulk purchase wines for consumption at official events and for display in the wine cellar. These wines would be reimbursed as an allowable representation expense. This procedure would also allow for donated wines to be used in lieu of the wine purchased as long as the donated wine is replaced with a similar value wine. Currently, the residence manager is the only person designated to order, receive, record, and maintain an inventory of the wine. The OIG team believes that management controls should be strengthened. The management section should conduct periodic physical spot checks and conduct an annual inventory. Department guidance requires posts to procure American wines through bulk purchase, with representational funds and to order, receive, inventory, and issue the wines in the same manner as other controlled expendable items. The same practice should be followed with the donated wines. For the record — this is the first wine cellar ever constructed in the residence of an American ambassador. Speaking of US Embassy Rome, the recent OIG report on support for employees in high stress, high threat, unaccompanied posts has singled out the previous leadership at the embassy in its support for returnees from these assignments. Unnamed in the report, but we presumed this was under the leadership of Ambassador Spogli. The Chief Information Officers Council issued a report that you should read if you are a supervisor, a manager or a senior executive or want to be one. The Norms of the Net-Gen World. They don’t want to be labeled. They want continuous feedback and recognition. They want autonomy, responsibility, and challenges. They’re used to having their opinions heard. They’re used to group/team problem solving. They expect high tech/constant stimulation. They’re used to living in a 24/7 environment. Curious about what contributes to their engagement? 1. Show that the organization understands their world. 2. Rethink authority and hierarchy within the organization. 3. Include Net-Geners in re-designing work practices. 4. Design jobs and work spaces to support collaboration. 6. Invest in technology to power high performance, creativity, and collaboration. 7. Examine how new technology is deployed within the organization. 8. Refresh organization websites and their capabilities. 9. Re-examine career paths for all generations. 10. Customize training programs for individual workers. 11. Encourage and incentivize Boomer and Net-Gen mentors. 12. Examine current and future supervisory bench strength. 13. Measure performance by productivity, not physical presence. 14. Retool performance recognition programs and provide more continuous feedback. 15. Create dynamic recruiting programs that employ a cross section of media. 16. Be authentic when recruiting; emphasize organization values and strengths. 17. Create a dynamic onboarding program. 18. Fund and use hiring flexibilities strategically. 19. Create a more flexible and fun working environment. 20. Craft lasting networking relationships with employees who leave the organization. The SFRC held hearings on the nominations of the following executive nominees last Wednesday. Archived video of the hearings and opening statements of the nominees are available here. The US Senate Foreign Relations Committee is holding a hearing on the nominations of the following executive nominees this Tuesday. Livestream of the hearings and prepared statements of the nominees are available here usually on the scheduled date. Did you hear about the RSO who wanted to know about all your Facebook contacts? RSO, as in Regional Security Officer. Apparently at one overseas post, the RSO has asked employees to inform the Security Office of all their Facebook contacts. Did you see that covered in the use of social media under 5 FAM 790? If I were a paranoid RSO, I’d be thinking that Internet Russian spy sensation, Ana Chapman may have “friended” you guys in Facebook and you forgot about her. Check your Facebook contacts, pronto! Seriously, let’s see what the new policy of using social media say about this? See — did that say anywhere that you must report all your social media contacts? a. The Department’s regulations have long required employees to report contacts with nationals of certain countries, due to both intelligence and terrorism concerns. Presidential Decision Directive/NSC-12 issued specific instructions and mandated that all U.S. Government agencies implement similar programs. The following procedures meet the President’s requirement that those who serve in America’s most sensitive jobs work with security offices to guard against illegal or unauthorized access to classified or otherwise sensitive information. of actual or attempted exploitation by a foreign entity. compromise of U.S. employees and national security interests. Employees are considered partners in the management of this regulation. media, facsimile, wire, and/or amateur radio. I’m not making this up, dude! This is publicly available material for anyone. (1) Unofficial contact with a national from a country with critical HUMINT threat posts listed on the Department’s Security Environment Threat List (SETL) if the employee and/or critical threat foreign national suggest, agree to, or actually have a second meeting after an initial encounter. Does online encounter in blogs, Facebook, Flickr, YouTube, Twitter, etceeetera — count as initial encounter? Does online encounter counts as a meeting for purposes of “second meeting” described in this section? Given the networked nature of social media, if you are in a “critical HUMINT threat posts” does that indeed means reporting all the names in your Facebook account or your spouse’s Facebook account? Or your kids’, or grandma’s? Oh, how tricky is that? On second thought, let’s say for a moment that the RSO who wanted to know about all your Facebook contacts is on the right side of the regs — post’s 100 employees have approximately 100 Facebook contacts each, not counting other social media accounts. That’s 1,000 10,000 names that the RSO shall have collected at the end of the day (sorry, misplaced my brain cells last night, thanks Chris)!). So …. Who will have time to comb through the names or process such info into understandable boxes of data. The RSO, presumably. And while he/she is doing that, who will be doing his/her non-social media police duties? Somebody might want to ask Diplomatic Security for clarification since they wrote this policy (it looks like — in April this year). But really, somebody over there who actually uses the various social media and not just looks through them ought to get a red pen and go through the regs once more. That said — it may not be Ana Chapman, and this RSO may not have a real good reason for asking about those contacts last month but this week, he’ll have an excellent argument. On June 22, Computer World reports how a fake femme fatale shows the risks of social networks. 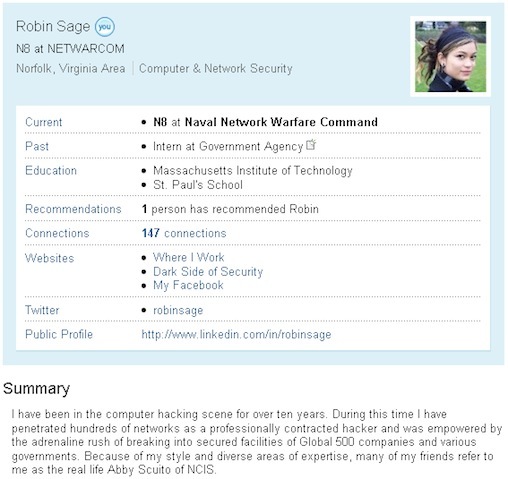 Hundreds of people in the information security, military and intelligence fields recently found themselves with egg on their faces after sharing personal information with a fictitious Navy cyberthreat analyst named “Robin Sage,” whose profile on prominent social networking sites was created by a security researcher to illustrate the risks of social networking. Kristie A. Kenney is a career member of the Senior Foreign Service. She most recently served as the U.S. Ambassador to the Republic of the Philippines. Prior to that, she served as the U.S. Ambassador to the Republic of Ecuador. Her Washington, D.C assignments have included serving as the Executive Secretary of the Department of State, Director of the State Department Operations Center, and as a member of the National Security Council staff under President Clinton. She also served in Argentina, Switzerland and Jamaica. She received a Master’s Degree from Tulane University and a B.A. from Clemson University. We have previously posted (see links below) about Ambassador Kenney here during her stint as ambassador to the Philippines. Ambassador Kenney is also the other half of a tandem FS couple, her husband is the current ambassador to Colombia. Three for three now. If confirmed, this would be Ambassador Kenney’s third ambassadorial post, after Ecuador and the Philippines. Her husband, Bill Brownfield currently of Bogota was previously ambassador to Chile and Venezuela. On May 7, President Obama announced his intent to nominate Peter Michael McKinley to be Ambassador to the Republic of Colombia but he has yet to be confirmed by the Senate. Jo Ellen Powell is a career member of the Foreign Service, class of Minister-Counselor. She most recently served as Consul General in Frankfurt, Germany. Prior to that Ms. Powell was the Executive Director of the Bureau of Western Hemisphere Affairs, Director of the Office of Employee Relations, and Management Counselor at the U.S. Embassy in Canberra, Australia. Other overseas assignments include France, Italy, Lebanon, and Jordan. In Washington, Ms. Powell served in the Executive Secretariat and the European Bureau Executive Office. She received her B.A. from Centre College in Kentucky. If confirmed, she would succeed career diplomat, Mark Boulware who was appointed chief of mission of US Embassy in Mauritania in 2007. 1. Temporary Duty (TDY) employees. These employees are short-term, lessthan 6 months, and long-term, more than 6 months but less than 1 year. 2. Permanent Change of Station (PSC) employees. These permanent postemployees have assignment orders for a 1- or 2-year tour. 3. Section 3161 hires. These are employees who are hired under a specialauthority (5 U.S.C. 3161). The employees are assigned to the Iraq TechnicalAdvisory Office in Washington, but most are sent TDY to Iraq. The employees’ U.S. Government appointments terminate when their Section 3161 appointments end. OIG reviewed overtime for 2008 and 2009 and found that American employees in Embassy Baghdad submitted 777,888 hours of overtime, totaling about $36 million, for those 2 years. During 2008, an average of 287 (50 percent) of 570 Americans claimed overtime during each pay period, with a total cost for that year of $18,207,654. In 2009, an average of 352 (51 percent) of 695 Americans claimed overtime during each pay period, with a total cost for that year of $17,745,039. Although OIG found that the average number of claimants increased for 2009, the number of overtime hours actually decreased, from 400,875 to 377,013 hours. Since the time of OIG’s audit, Embassy Baghdad has initiated a program to monitor the number of overtime hours worked and to send quarterly reports to supervisors for an explanation of excessive amounts. While the Embassy’s program assesses indications of potential abuse of overtime hours, it does not address compliance with supervisory authorization for overtime, supervisory approval of timesheets, or the provision of complete and accurate information to Charleston (SC) Global Financial Services Center for payment. Did not enforce regulations requiring supervisors to approve T&A reports based on actual hours worked and authorize overtime hours in advance of work. Did not require employees to attest to the accuracy of the hours and leave charges shown on their T&A reports. Allowed employees, not their supervisors, to transmit their time sheets directly to Charleston. OIG’s July 2009 inspection report on Embassy Baghdad indicated that supervision over overtime claimed by Section 3161 contract employees was inadequate. To determine whether Section 3161 employees had a predominant amount of overtime, OIG analyzed overtime by the three general categories of American personnel eligible for overtime. OIG found that during 2008 and 2009, 44 percent of the personnel were Section 3161 hires, 37 percent were Permanent Change of Station employees, and 19 percent were Temporary Duty employees. While Section 3161 employees received the greatest share of overtime, OIG determined that the amount of overtime was not excessive when compared with that of other types of employees.